Olga Slavnikova was born in 1957 near Ekaterinburg. 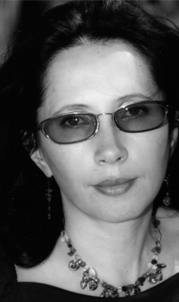 She writes reviews and essays for Novy mir, Znamya, Oktyabr. She was a member of the Russian booker prize jury in 1999. In 2000 she was part of the board for the Novy mir Prize for short stories and now organizes the Debut Prize of the Pokolenie fund. Her novel "Strekoza, uvelichennaya do razmerov sobaki" was shortlisted for the booker prize in 1997. "Odin v zerkale" won the Bazgov Prize and was nominated for the Booker Prize in 2000. 2006 she was awarded the Russian Booker Prize for her novel "2017". She also received the US Gjenima Prize 2006-2007. Olga Slavnikova lives in Moscow.